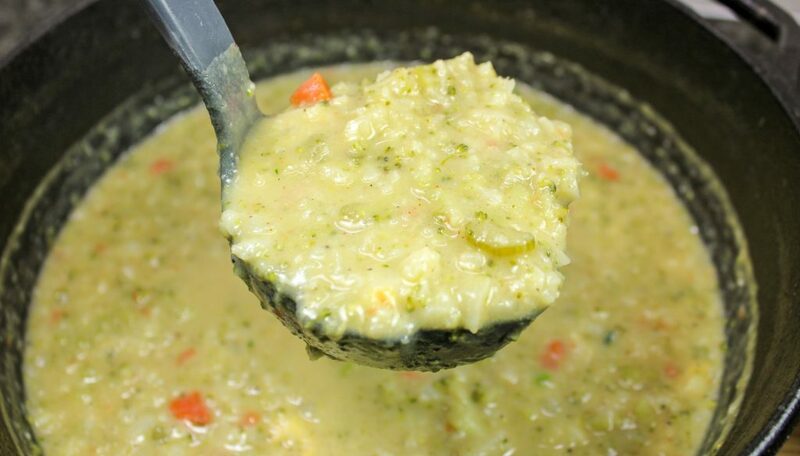 Broccoli Cauliflower Chowder is a thick and hearty soup for a cold day. Creamy soup and fresh veggies make the perfect bowl of comfort food. Weight Watcher friendly-5 SmartPoints! 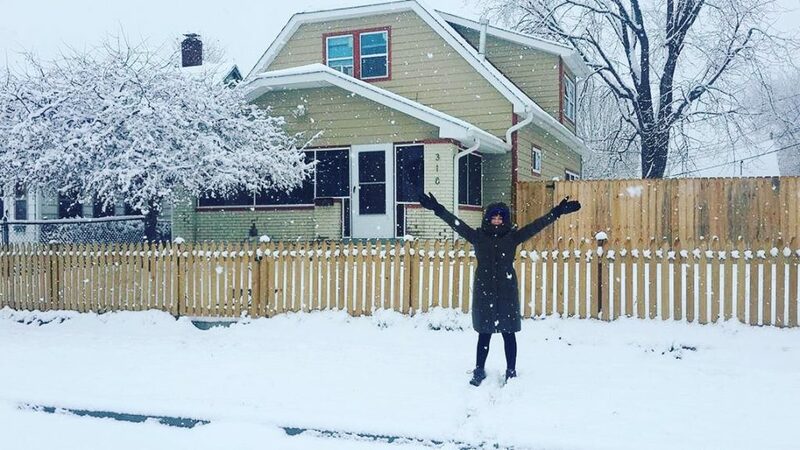 Winter is in full swing here in Indianapolis. I say this as I look out the window and watch the snow fall on the ground. Never in my life did I think I would live in a place where it snowed! What a dream. It’s days like this that make me happy to be INSIDE with thick socks on. During the winter months, all I crave is hearty soups and stews. Even when I lived in Texas where winter was 55 degrees outside, I still craved soup. 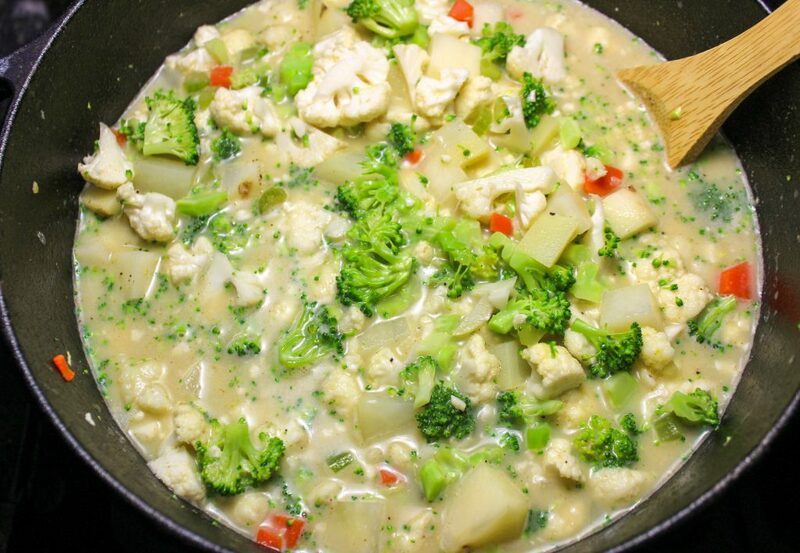 My Broccoli Cauliflower Chowder is the perfect healthy and hearty soup for a cold day. Thick, creamy soup with fresh veggies make the perfect bowl of comfort food. This is a Weight Watchers friendly recipe and 2 cups is 5 SmartPoints. A week before Christmas it snowed about 4 inches here in Indy and you should have seen me. I was like a kid! I’ve seen snow, but haven’t seen snow while it’s actually snowing. My husband and I had probably the best day ever playing in the snow. Even our dogs loved it! It’s not snowing as much today, but watching the snow still makes me happy. It’s just so pretty! Days like this make me super happy we decided to move to Indianapolis five months ago. We moved to Indy for a lot of reasons, but the main reason was to help set our family up for success. The cost of living is WAY better here than in Austin, Texas. Our quality of life is so much better I can’t even believe it. Plus, we get to experience all four seasons! I love soup… Not only because there are so many different variations of soups, but because it lasts for several days. I love meals that can stretch so that I don’t have to cook every day during a busy week. One of my favorite soups is broccoli cheese soup. 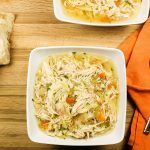 Since this is a Weight Watchers focused blog, I made my own variation of this classic soup with all the same flavors, without the guilt. My Broccoli Cauliflower Chowder is the best of broccoli cheese soup with less fat. This soup is packed with flavor and vegetables. Fresh broccoli, cauliflower, potatoes, carrots, celery, and onions! The best thing about this soup is that it is made and ready to eat in less than ONE HOUR! To get started, chop white onion, carrots, celery, and garlic. Peel two small potatoes and chop into ½ inch cubes. Next remove the leaves from the cauliflower, remove the stem, and chop the cauliflower into small florets. You can use already chopped bagged broccoli or chop the broccoli yourself. Once all the veggies are chopped, in a Dutch oven or a large pot sauté the onion, carrots, celery, and garlic until soft. After the veggies are soft, you will make a roux. 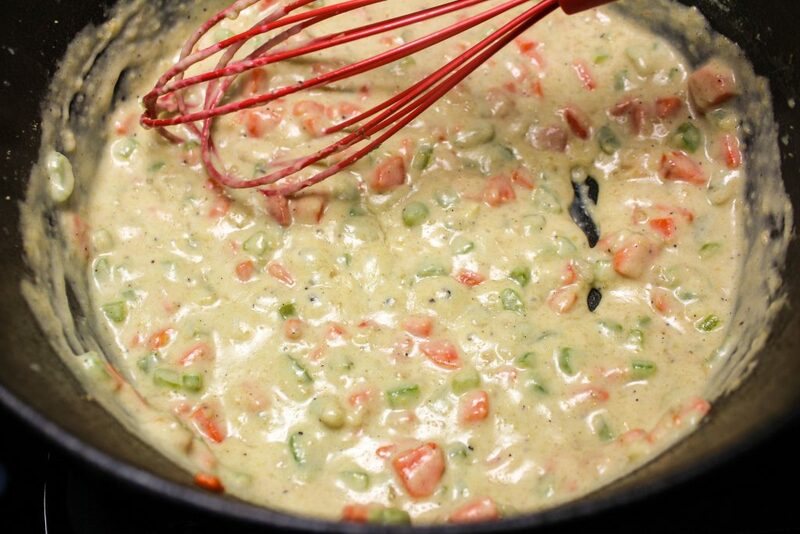 To make a roux, just add a little bit of flour and whisk into the veggies. Slowly keep adding the flour, while whisking at the same time, until all the flour has been added to the pot. If needed, add a bit of vegetable broth to help break up the clumps. 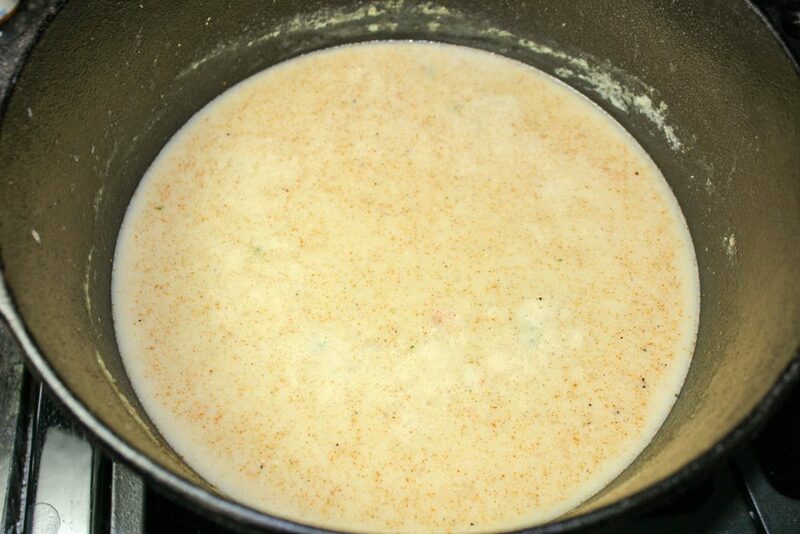 Next add vegetable broth and milk slowly whisking to break up the clumps until all the liquid has been added to the pot. Add the spices and let the liquid thicken, for about 5 minutes. Once the liquid has thickened up a bit, add the chopped broccoli, cauliflower, and potatoes. Bring to a boil, reduce heat to simmer, cover, and cook for 10-15 minutes. Once the veggies are fork tender, mash with a potato masher until you reach your desired consistency. I like my chowder with chunky bits of vegetables, but it’s up to you! 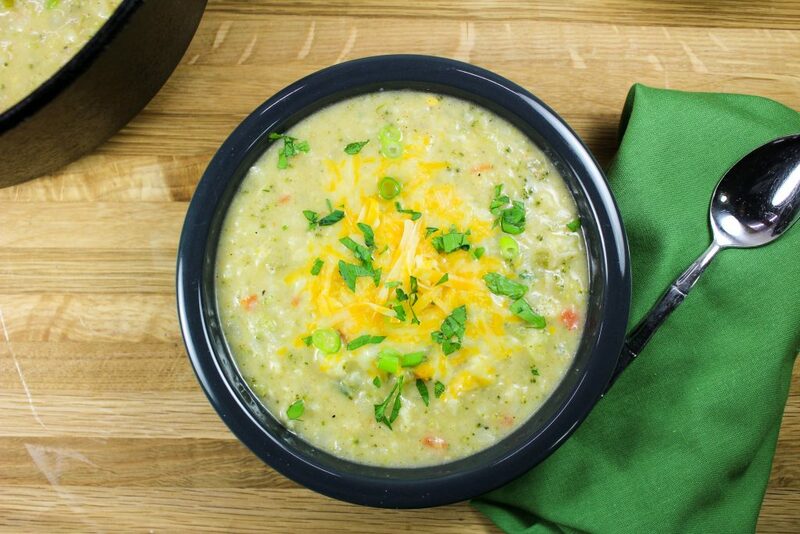 Broccoli Cauliflower Chowder is the perfect healthy and hearty soup for a cold day. 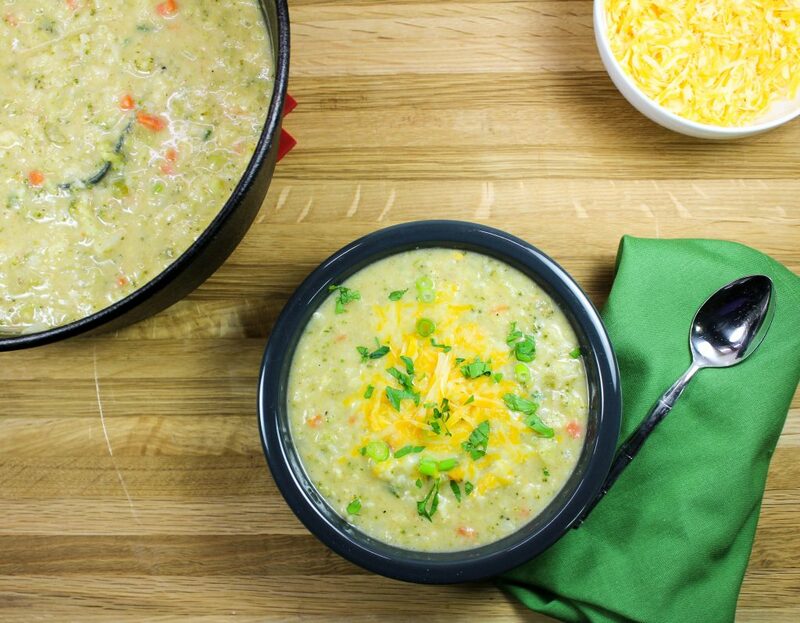 Thick, creamy soup with fresh veggies make the perfect bowl of comfort food. Freezer friendly and made in less than 1 hour! One serving (two cups) is only 7 SmartPoints! I like to serve my soup with a sprinkle of reduced fat Colby jack cheese and parsley. 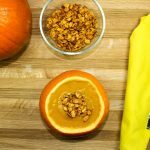 Weight Watchers friendly and 5 SmartPoints for two cups! I hope you enjoy these comforting bites of flavor! Chop onion, carrot, celery, and set aside. Peel potatoes and chop into ½ inch cubes. Set aside. Remove leaves from cauliflower and chop into florets. Set aside. Cut broccoli florets and a few of the stems. Set aside. In Dutch oven or large pot, heat over medium heat and add butter. Add diced onion, carrot, celery and sauté for 5 minutes. Add flour slowly and whisk into vegetables, Cook for 2 minutes stirring frequently. Add a few tablespoons of vegetable broth if needed to help break up the clumps. Add vegetable broth, milk and whisk until smooth. Add pepper, salt, mustard powder, and cayenne pepper and mix well. Let the roux sit for 5 minutes to thicken. Add broccoli, cauliflower, potatoes, and green onion and bring to a boil. Cover and cook for about 10-15 minutes until all vegetables are fork tender. Smash veggies with large wooden smooth to break up a bit until you reach desired consistency. Garnish with shredded cheese and parsley. January 6, 2017 at 8:23 pm Oh thank you so much for the pin Jessi! January 6, 2017 at 8:22 pm Thank you Kaitie!! January 6, 2017 at 1:49 pm THIS looks fantastic! Can't wait to try! January 6, 2017 at 8:22 pm Thanks Jehava... I hope you try this soup soon!! January 6, 2017 at 4:15 pm I think I found this recipe just in time. It's snowing here today. Snow day and warm soup, perfection. January 6, 2017 at 8:22 pm YAY, glad you found it!! Thanks Dawn! January 6, 2017 at 8:21 pm Yes!! It's still cold here... I wish I had some of this soup right now! January 6, 2017 at 8:11 pm Ok this looks incredible!! Talk about the ultimate comfort food and easy on the waistline :) Perfect for a winter day! January 6, 2017 at 8:21 pm I know... the best of both worlds!! January 6, 2017 at 11:41 pm The perfect comfort food! Looks delish! January 9, 2017 at 9:24 am Thank you Shannon!! January 9, 2017 at 9:25 am Thank you Neha! I hope you do give this a try!! 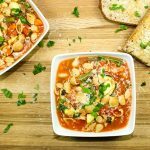 January 9, 2017 at 11:30 am I love soup in the winter. This is healthy too. Will definitely try it. Thank you for posting the recipe. January 10, 2017 at 4:12 pm I hope you do try it Roy!! 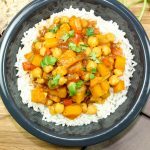 January 9, 2017 at 11:40 am Looks delicious and will be perfect for meal prepping! Thanks for the recipe! January 10, 2017 at 4:07 pm Thank you for commenting Emily! January 9, 2017 at 12:04 pm This looks so good! It's perfect for a cold winter day. I pinned it to make one evening for my family. January 9, 2017 at 12:18 pm I need more soup in my life. This looks delicious and so easy to make. I'm pinning it so I can come back to it another day to make it. January 10, 2017 at 4:07 pm Thank you for pinning Alexandria! January 10, 2017 at 4:06 pm Awesome! Thank you Clarissa! January 9, 2017 at 1:10 pm This looks so fantastic! I'm definitely adding this to my dinner rotation while the weather is freezing. Thanks for sharing! January 10, 2017 at 3:56 pm Thank you Callie! January 10, 2017 at 3:55 pm It really is!! Thanks Courtney! January 9, 2017 at 10:23 pm I will have to come back and make this sometime! It looks really good! January 10, 2017 at 3:54 pm I hope you do make this sometime! Thanks Brittany! January 11, 2017 at 4:06 pm This sounds delicious. I love that you added cauliflower in. And yes, I hear you on the cold weather. I rock the thick socks too (and a bathrobe over all my clothes) all winter. It looks like you and your adorable pup had fun though. 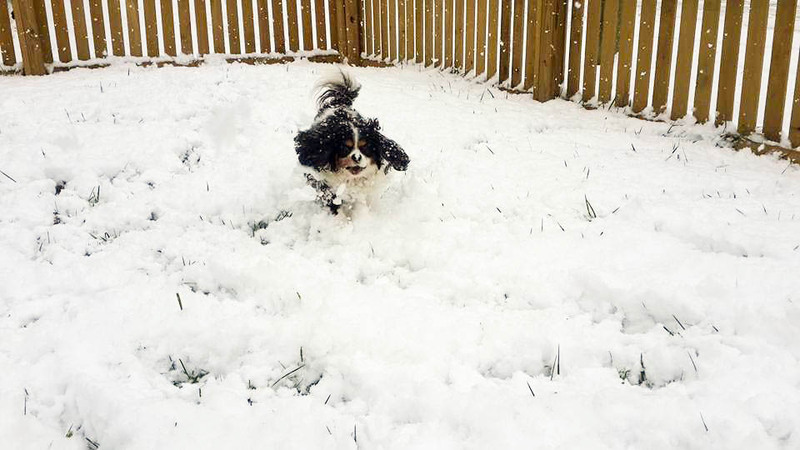 Is your dog a cavalier king charles? So cute! January 12, 2017 at 11:30 am Thanks Jenna! Yes, that is a Cavalier :) !! !